The soft ringing of sheep bells is as central to highland identities as the boiling torrents and the wind whistling through cabin planks. A highly sophisticated folk music that only farmers and shepherds know how to compose by choosing the right combination of bells and beasts. A rejuvenating concerto featuring bells and song. By Guillaume Lebaudy, ethnologist, director of the Maison du Berger in Champoléon. Since the 1970s, Jean-Luc Joseph has documented rural life in the Arly Valley in Savoy, an area where the violin reigns. His passion has never faltered. A meeting with a photographer and amateur musician with a very humanistic approach and whose photos stand out for their authenticity, striking just the right note. By Sophie Boizard, editor of L’Alpe. Revolution ! For the past two decades, they have been reinventing Swiss folk music with their accordions or simply with their voices. Funk music played with an Alphorn ? Jodel electro-style ? 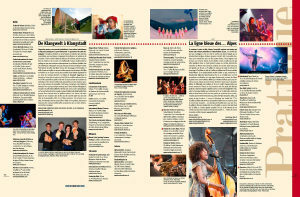 Appenzell waltzes with contemporary music ? Anything goes. These new musicians are engaged in a surprising battle with traditionalists. By Manon (Greta) Wallenberger, transhumant shepherdess and free spirit. The mountain-refuge tour is an exceptional project. What is the basic idea ? Bring music to mountain dwellers and music lovers to the mountains through a series of high-altitude concerts. By Laetitia Cuvelier, former postwoman and refuge warden, now writer and journalist. This prayer by shepherds heard in the past, at dusk, in German-speaking Switzerland and Liechtenstein, has virtually disappeared. An odd chant that would appear to arise from ages past. By Christophe Gros, assistant-curator in the European department, and Federica Tamarozzi, ethnologist and patrimonial curator at the Ethnographic museum in Geneva. The Mountain museum in Turin has over the years pulled together a remarkable collection of almost 250 music scores. Classical or comical, narrative or ornamental, understated or baroque, the covers speak to the relationship between music and the mountains. Here and abroad. By Andrea Gherzi, author and composer, graduated from the Turin conservatory and university. This guide lists by country, date and type of music the best festivals during the summer of 2016 in the seven countries of the Alps, as well as the favourite events of friends of the editorial team here. Conductor of the orchestra here at L’Alpe, Dominique Vulliamy. Fort or monument ? In the 1800s, the history of castles in the Savoy was rewritten according to a very imaginative view of the Middle Ages. In response to this overly romantic vision, a scientific approach arose, driven be enthusiasts, archaeologists, archivists and artists. An exhibition in Annecy highlights, among other approaches, these pioneers who attempted to restore the historical sites while respecting their true history. By Sophie Marin, policy officer for patrimonial conservation at the Museum-château in Annecy. The philosopher, member of the Académie française, has always stood out for the spontaneous clarity of his insights. Invigorating and enlightening, his pleasure in knowledge is contagious. 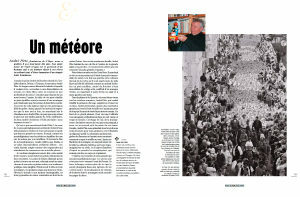 By Pascal Kober, editor-in-chief at L’Alpe. 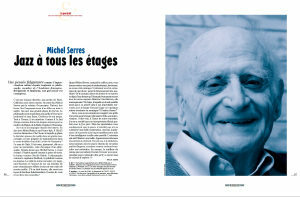 Michel Serres welcomed the editorial staff to his home to discuss, for almost two hours, his relationship with mountains, rural life, music, language, writing and knowledge. 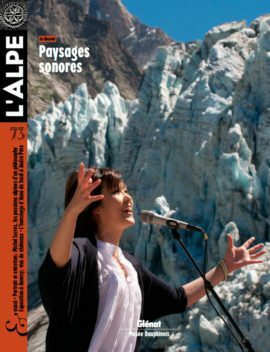 A vibrant and stimulating meeting… By Sophie Boizard, editor, and Pascal Kober, editor-in-chief at L’Alpe. Le Clézio inspired photographer Jean-Christophe Béchet to follow in the footsteps of the persecuted Jews who attempted to cross the Franco-Italian border in the Mercantour mountains in 1943. An impressive, even daunting photographic project in an inhospitable region where the past is very present. André Pitte, who founded L’Alpe, left us exactly ten years ago. His friend, the writer Anne de Staël, draws here the portrait of a man who injected life into his dreams by bringing together so many fellow human beings. Wonderful.